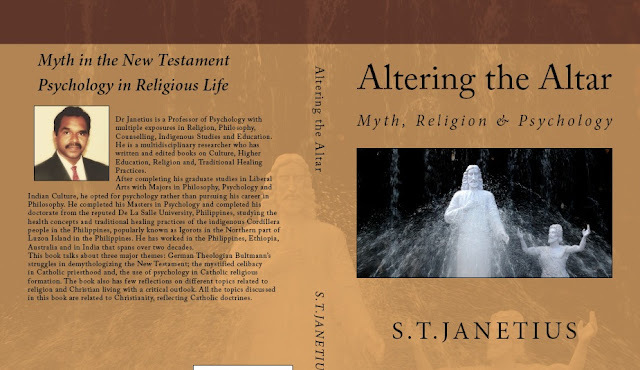 This book primarily deals with three themes which are written at different times of my life: the phenomenon of myth in the holy scriptures, celibacy and Catholic priesthood and the use of psychology in Catholic religious formation. All the themes are reflecting Catholic Christian doctrines. The book also contains few reflections on religion. The first part of the book which narrates the phenomenon of myth in the New Testament was written when I was fascinated by philosophy, theology, religion, and mysticism. I strongly believe that religious language is mythical, religious practices are culture-specific and claiming this unique cultural concepts and interpretations as universal truth-claims lead to fanaticism. The mythical language of the scriptures creates confusion in the modern mind and it needs reinterpretation for the modern mind to comprehend. Bultmann, the German theologian came with a solution demythologization. I wonder whether he has any followers to adhere his views today. The second part of the book talks about priestly celibacy in the Catholic Church. My interest in this topic started during my postgraduate studies in the Philippines, at De La Salle University, Manila, where I was introduced to Rev. Kelly, an Irish Catholic Missionary Priest, married to a Filipina and settled in Manila. He invited me few times to the annual convention of the Philippine Federation of Married Catholic Priests (PFMCPI ), held during the holy week, and introduced me to the Married Priests in the Philippines. I attended couple of their annual conventions (at Baybay City–Leyte & General Santos City-Mindanao). This connection made me to explore deep into the concept of Biblical celibacy and canonical mandatory celibacy for Catholic priesthood. Also, I did a research in the unexplored area of married priests in the Philippines. New Testament which was centered on the historical Jesus of Nazareth and the mythical stories and narrations in the latter years mystified celibacy, even projecting Jesus of Nazareth as a celibate person. The Pauline Gnostic doctrines, as well as the teachings of early church fathers, strengthened this concept in the course of time. Now, an obligatory requirement to serve as a priest in the Catholic Church, giving religious men and women more freedom to commit themselves for the entrusted mission, has become a major hindrance and preoccupation leading to many global sexual scandals. The third part of the book talks about the use of psychology in the formation of young men and women in the Catholic religious communities of monastic tradition and missionary action. The socialization and human development issues of religious men and women in the Catholic religious formation after the paradigm shift following the Second Vatican Council has changed the meaning and perception of religious life. Men and women following various monastic, evangelical traditions living in the confined comforts, who were secluded at the monasteries and convents, following various pious practices, have started to come out to the streets to serve the needy, both spiritual and material. This gave new orientation, meaning, function to consecrated religious life, changing its goals completely. From an individualistic religious orientation that was anchored on personal attainment of eternal glory, by leading a pious religious life and preparing the lay people for good Christian living (identified as following the norms of the Church) as well as converting people to Christianity (saving pagan souls from entering eternal fires of hell), a social outlook evolved evidently after the Second Vatican Council. The narrow vision and concept of pre-Second Vatican religious monastic tradition did not give room for serious focus on the human development and psychosocial formation. People did not think about it. The religious, priestly training was completely anchored on controlling the human sexuality in the form of celibacy and, or on the three vows, namely, poverty, chastity and obedience for communal living. The most neglected aspects were continuing human development related to psychosocial and psychosexual issues. Today, liberated from the traditions and stereotypes of seclusion, the consecrated religious men and women look for more social outreach; sometimes even at the cost of neglecting their religious identity. Instead of confining themselves to the secluded walls of churches, monasteries, and convents, the extended prospect direct the consecrated pious men and women to try a pivotal role in transforming people and society. Thanks to the liberation theology that evolved in Latin America and spread over the developing countries, Catholic religious communities started to focus on the training and formation on psychological, emotional, spiritual, and intellectual wellbeing, to see them as mature and effective individuals, to lead a meaningful life as sanctified people. As too many sexual scandals looming around the globe, mainly from poor handling of celibate life and living, many priests are battling with legal concerns arising from both true charges as well as fake accusations, the religious communities have taken seriously in their religious formation the human personal, social and sexual development issues that are pertinent to their consecrated life. Psychological screening in selection, renewal programs on adult development and midlife transition issues, lessons on the broader understanding of celibate love, friendship and living, the inclusion of psychology and psychotherapy in ongoing formation, are gaining popularity. These scientific psychotherapeutic interventions are intended to help the candidates to discover their enslaving reactive behavior patterns, which in turn would help them in responding to the demands of authentic religious life, Christian and human living. Mainly, the process of making the unconscious into conscious is often focused in order to attain freedom from the binding factors to attain psycho-spiritual integration. Besides these three major themes namely, the struggles of Bultmann’s demythologization, the mystified celibacy in Catholic priesthood and, how psychology could be utilized in a healthy way in the Catholic religious communities, the book also has few reflections on various topics related to religion and Christian living with a critical outlook.